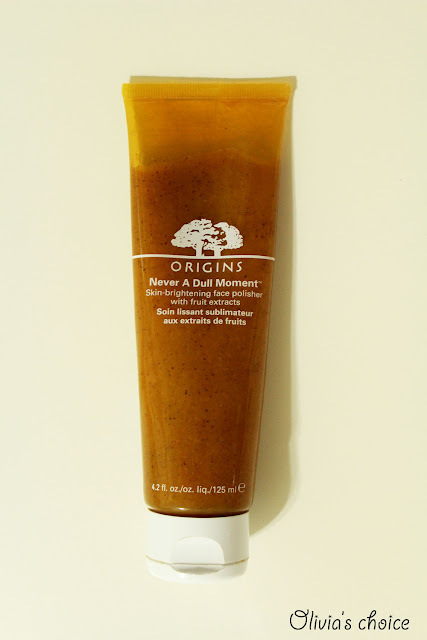 I've had the Origin's Never a Dull Moment Face Polisher for about 3 months now. I've been a bit disappointed by this product in the sense that I was expecting a scrub, when the product label always made it clear that this was a skin-brightening face polisher. I unfortunately was not aware of the difference between the two when I bough this. After doing some research, I can finally tell the difference between a face polisher and a face scrub. A face scrub has bigger and thicker granules, and is to be used once a week as it provides a much deeper exfoliation, rubbing off a thicker layer of dead skin. A face polisher, on the other hand, is way softer, with finelly milled granules, designed to invigorate your skin by leaving it soft and glowing, but not to slough off dead cells in the way a scrub does. Face polishers will never be as effective in removing dead skin as a scrub, so this may be a good choice for very sensitive skins that get irritated with scrub. For the rest of us though, since a face polisher will never have the effects of a scrub in getting rid of impurities, if you really feel like using one, you need to bear in mind that its effects are basically softening and brightening, and that you will need to buy a scrub to keep up with the exfoliating work. How do I feel about this product after all? This product smells yummy, with all the mango, papaya and apricot enzymes combined, even if I'm more into "clean" fragrances for my skincare. I rub it on my wet face, neck and sometimes décolleté, and rinse it with warm water after a minute or so. You can immediately feel the softness in your skin. It's really impressive, the skin feels like a baby's. I'd say it brightens my complexion too, but then I'm not 100% sure about that, since I think I'm too young to actually have dull skin. The downside here is its effect being way too short. The softness disappears from my face in about an hour. I use this once to twice per week, and twice seems like enough. A good thing to point out is this tube seems to last forever. I still have more than 80% left! Would I recommend it? Not really. The effects are not that obvious, so I would avoid spending that much money on this product. At this price, there are better choices for your skin out there! There are currently 15 Origins stores in Hong Kong. Find out their location here. This was a really great and thourough review! Very well done. I am glad that I now know the difference between a scrub and polish! Thanks! Thanks for a review! It's actually imposrtant info! But I have a sitution when it was said that it's a scrub (so I was planning for intensive work of this product) and in real life it was just a face polisher =| I was so angry and disappointed! It's a beauty crime to mislead customers! I really like this product however I would prefer it in the jar as opposed to the tube. Thanks.